Chapter 1 - Cooperation and Competition. Chapter 2 - Simple Cooperative and Competitive Systems. Chapter 3 - The Full Ordinary Economic State. Chapter 4 - Theoretical Analysis of the Game Model. Chapter 5 - Diffusion of Wealth. Chapter 6 - Wealth Diffusion and Control. Chapter 7 - The Mid-East. Chapter 8 - Electric Circuit and Wealth Simulation: An International Perspective. Chapter 10 - The Moral Basis of Sustained Economic Growth: The Triumph Of Cooperation. Table of Contents of CD Accompanying the Book. 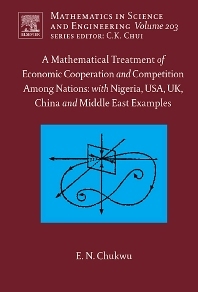 The book presents a careful mathematical study of Economic Cooperation and Competition among Nations. It appropriates the principles of Supply and Demand and of Rational Expectations to build the dynamic model of the Gross Domestic Products of two groups of nations which are linked up together. The first group consists of Nigeria, the US, the UK and China. The second group is made up of Egypt, the US, Jordan and Israel. The link connecting the four nations of each group is mirrored in the net export function which is broadened to include trade, debts and the inflow or the outflow of wealth from the competing and cooperating nations. This realistic models of the four interacting GDP's, a hereditary differential game of pursuit are validated with historical data from International Financial Statistic Year Book. The Mathematical model is then studied for controllability: from a current initial GDPs a better state can be attained using government and private strategies which are carefully identified. We use regression and differential equation methods to test whether the four countries are competing or cooperating. The consequences of competition or cooperation are explored. Cooperation can be realized and the growth of wealth assured because the system is controllable and we can increase the growth of GDP and then increase the coefficient of cooperation. The outcome may be unbounded growth of wealth for all concerned – the triumph of cooperation. With analogous simple examples the book shows that sufficiently cooperating systems grow unbounded and competing ones are either bounded at best, or become extinct in finite time. If competition is small, i.e., limited, or regulated the GDP's need not be extinct even after a long time. This results are in contrast with popular opinion which advocate competition over cooperation. The detailed policy implication of the cooperation analysis at one time or the other were advocated by Pope John Paul II, President Clinton and President Bush. The mathematical message is clear: the strategy of cooperation is the best way in an Interconnected World: Cooperation triumphs over competition. The same type of analysis allows the book to argue through modeling that prosperity, internal peace and harmony can flourish in Nigeria among the old three regions and the newer six geopolitical regions. The same is true for the four powerful states in the Middle East. Thus the author’s refreshing approach is the "scientific" treatment of cooperation and competition models of the gross-domestic product of two groups of nations – Nigeria, the USA, the UK, and China, and the USA, Egypt, Jordan and Israel. Attempts are made to provide "scientific" answers to broad national policies. It allows predictions of growth to be made with some degree of accuracy for up to 4 years. MATLAB and Maple programs in accompanied CD are provided. The author's individual nations economic models are cited. The dynamics are ordinary and hereditary games of pursuit also cited from the original earlier writings of the author are models of the economic state of each nation – a vector of six things – the gross domestic product (GDP) (y), interest rate R; employment (or unemployment) (L), value of capital stock (k), prices p(t), and therefore inflation and cumulative balance of payment (E). Each economic state is isolated except the impact of export function on aggregate demand. The main difference between this earlier contributions and this book is the link and its apparent policy implications and consequences. Study of Cooperation and Competition among Nations with real life examples from the World Bank, the IMF data of Nigeria, the US; the UK, China, Egypt, Jordan and Israel. Complete MATLAB or MAPLE program with data output and graphs, and possible realistic prediction of economic growth. Including a comprehensive CD presenting each program in an easy and accessible way. Realistic Model – comparison of real data and diagram of output. Duplicatable results. With the CD and IMF data and generic programs, other groups of nations' economies can be studied as well as the economy of all UN members as a group. Realistic Model - comparison of real data and diagram of output. Duplicatable results.